I was my dad’s vinyl-wallah: I changed his records while he lounged around drinking tea, and that’s how I know my Argo from my Tempo. And it’s why, when Dr Walid called me to the morgue to listen to a corpse, I recognised the tune it was playing. Something violently supernatural had happened to the victim, strong enough to leave its imprint like a wax cylinder recording. Cyrus Wilkinson, part-time jazz saxophonist and full-time accountant, had apparently dropped dead of a heart attack just after finishing a gig in a Soho jazz club. He wasn’t the first. No one was going to let me exhume corpses to see if they were playing my tune, so it was back to old-fashioned legwork, starting in Soho, the heart of the scene. I didn’t trust the lovely Simone, Cyrus’ ex-lover, professional jazz kitten and as inviting as a Rubens portrait, but I needed her help: there were monsters stalking Soho, creatures feeding off that special gift that separates the great musician from someone who can raise a decent tune. What they take is beauty. What they leave behind is sickness, failure and broken lives. And as I hunted them, my investigation got tangled up in another story: a brilliant trumpet player, Richard ‘Lord’ Grant – my father – who managed to destroy his own career, twice. That’s the thing about policing: most of the time you;re doing it to maintain public order. Occasionally you’re doing it for justice. And maybe once in a career, you’re doing it for revenge. 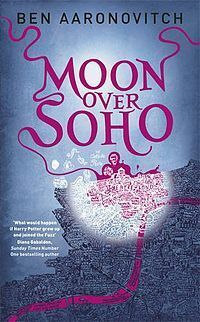 Moon Over Soho was a lot like its predecessor Rivers of London with just the right balance of humour and seriousness. I really like Aaronovitch’s writing style and the fact that it’s set in and around London is great – sometimes you’ll get say an American author writing about London or an English author writing about America and it just feels wrong – but Aaronovitch is a Brit and he brings that out in his writing with some trusty British witticisms. Moon Over Soho brings back much favoured characters from Rivers and the same kind of humour. Soho follows Peter Grant as he hunts down- wait for it – jazz vampires!! Nightingale is down for the count so Peter takes the reins for this case and the resurgence of the Pale Lady and her vaginis dentata – with some untimely deaths and a few dead musicians. Peter finds himself in a little bit of a romance with a lady called Simone who – oddly enough – was in a relationship with one of the dead jazz musicians. There was a lot of different side stories that all blended in together in this book which was a good thing. Everything apart from the mystery of the Pale Amy was solved at the end of the book with a nicely closed off ending; I think my biggest pet peeve with “crime” books is when they don’t solve the crime at the end of the book and leave a gaping cliffhanger with no resolution in the next book either. Although I didn’t like Simone – Lesley fan all the way – I felt a bit sorry for her at the end of the book. She didn’t seem overly trustworthy and had a penchant for sleeping with Peter when he should be working on the case. The ending was perfect! I loved it and the thing with Lesley? Amazing and I can’t wait to see where it goes in the following stories. Peter has his work cut out for him in the next books. The Masked Man as well is an interesting concept and I sincerely hope we see more effective him and his twisted ways. The writing was as before filled with internal monologues from Peter whenever he learned anything new; a healthy dose of sarcasm and a nice balance between normal and Paranormal to justify the oddities of the Paranormal world Peter is a part of.